The Horner Screamer is a large and massive South American bird. This species is fairly noisy, and both male and female sometimes engage in duets. The adult is huge, with short bill for such large bird. 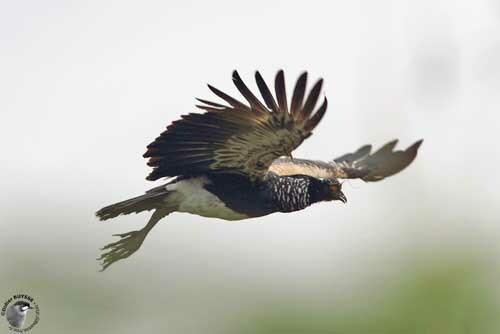 The upperparts are mainly greenish-black, with conspicuous silvery-white shoulder patch well visible in flight. Flight and tail feathers are blackish. On the underparts, belly and underwing-coverts are white. Crown and neck are blackish with barred white neck and finely spotted black and white head. We can see a long, bare quill or horn, sometimes broken, giving the species its name. It is present in both sexes. This horn is formed from a modified feather shaft of up to 15 centimetres long. 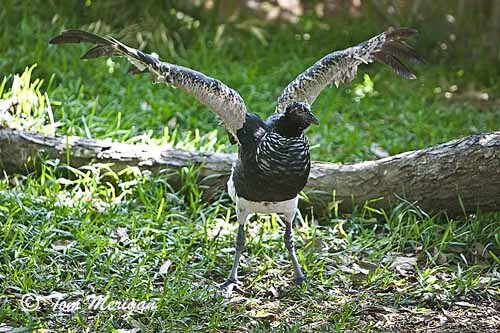 Like the two other species of this family, the Horned Screamer has two sharp protruding spurs from the bend of the wings. The bill is short, blackish and slightly hooked. The eyes are bright red. Legs and feet are pale grey. The toes are connected by a small web. The juvenile is duller and has shorter horn. The Horned Screamer has powerful voice. It gives far-carrying throaty “U-who’s”, and several “gulp-hoo” too. It also gives more raucous “quuk-quoo, quuk-quoo, yok-yok, yoik-yok”, but this phrase often varies. These birds are extremely vocal, uttering very loud and unmelodious sounds which can be repeated for hours. Calls can be heard as much as 3 km. During the breeding season, both mates perform interminable duets. They also call while flying and they produce noisy chorus at nightime roosts at dusk. Male’s voice is slightly lower-pitched. Both sexes sometimes produce guttural noises used to threaten at close range and also during the breeding season. This is a non-vocal sound produced by the subcutaneous air-sacs of the sides of the neck. 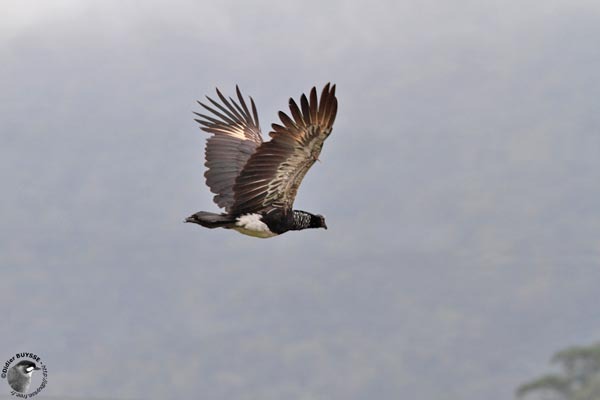 The Horned Screamer is named “Mohooka” by native peoples after its stunning voice. The Horned Screamer frequents humid habitats such as moist tropical forests, swamps, grasslands near water. They usually occur often near water, but during winter, they can be found in drier areas. 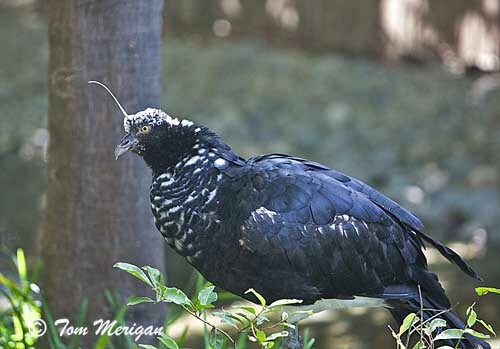 The Horned Screamer is found in Tropical South America, from Colombia, through Brazil to N Argentina. It occurs in the Amazonian regions and the eastern Llanos. The species is extinct in Trinidad and Tobago, and in the Guianas, but it is fairly widespread it its large remaining range. The Horned Screamer feeds primarily on various plant matters such as leaves, stems, flowers and the best parts of roots of aquatic vegetation. During the nesting period, the chicks feed on insects too. This species grazes like ducks and geese, both members of the order Anseriformes too. It may also dig in the mud in shallow water. It forages in marshy grass and in floating vegetation. While feeding on plant matters, it probably takes several arthropods and small dead animals that are among the vegetation. It is mainly diurnal, but it may feed some time after dusk too. 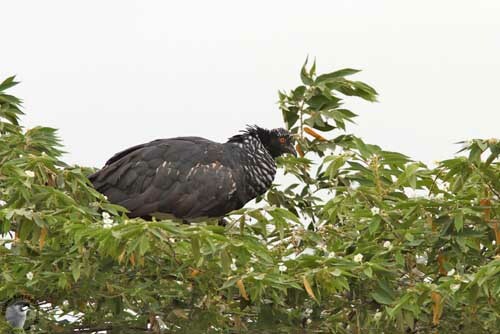 The Horned Screamers may roost in shallow water, but usually and for better protection, they spend the night in trees. They rest for long periods in trees, usually at top. If the bird is threatened, it flies straight up into a tree and calls loudly. This species is largely terrestrial, but it perches easily in trees, thanks to the long toes. It gives strident calls to proclaim its territory. 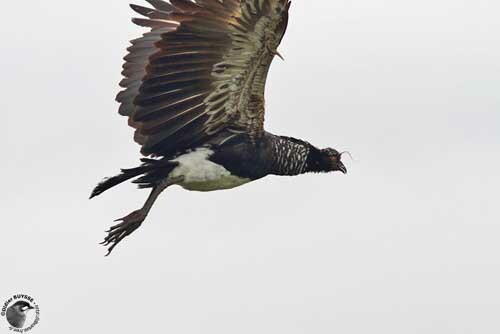 The Horned Screamer is monogamous with long-term pair-bonds. The breeding territory is maintained all year round and defended against all intruders. It is very territorial, using loud calls to mark the boundaries and inform the other pairs. The owner may adopt threat postures in order to display the reddish wing patches and the spurs. Spurs are used during fights, as the long horn which may hurt the opponent. For this reason, it is often broken. Aerial pursuits are common too. Between mates, pair-bonds are strengthened by calls in duet and mutual preening. Both mates walk side by side with the head almost touching the back. We can hear repeated low sounds produced by the subcutaneous air-sacs of the neck sides. Another display shows the male circling the female by walking around her with the bill pointing downwards and erected dorsal feathers. Wings are partially opened and lowered. Bowing often follows. Copulation takes place on the ground. 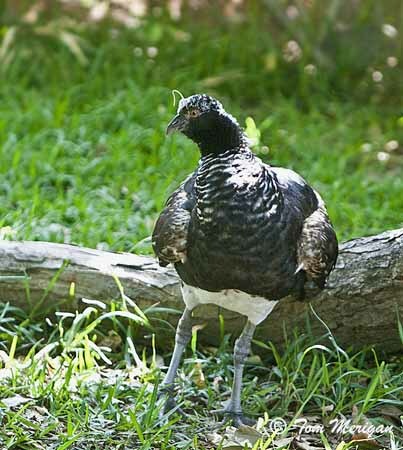 The Horned Screamer is sedentary but juveniles and non-breeding birds perform post-breeding local movements. The Horned Screamer is a good flier thanks to its long, broad wings. However, it takes off ponderously while performing heavy wing beats. Then, it glides and soars easily with outstretched neck, but its flights are usually short. 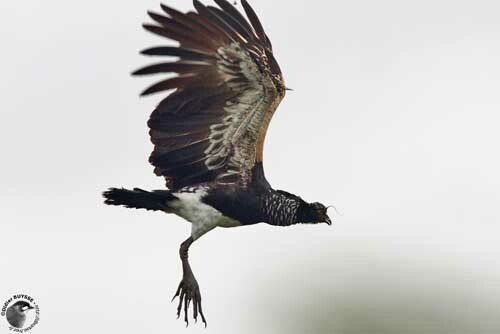 The Horned Screamer may nest all year round, but mainly during austral spring and summer. This species is solitary nester within its territory, and this area is strongly protected and defended. Both adults build the nest, a large pile of plant materials such as weeds, reeds and sticks, usually found in the vicinity of the nest. Some debris are added too. It is usually partially anchored to brush or grass in shallow water, or placed on dry ground not far from water. The female lays 2-7 eggs and both parents incubate during 45-47 days. At hatching, the chicks are covered in thick greyish-yellow down above and white below. They are precocial and leave the nest immediately, remaining close to adults and following them for feeding. The Horned Screamer feeds mainly on plant matter such as leaves, flowers, stems, roots of aquatic vegetation, mainly the tender parts. During the breeding season, the chicks consume more insects. 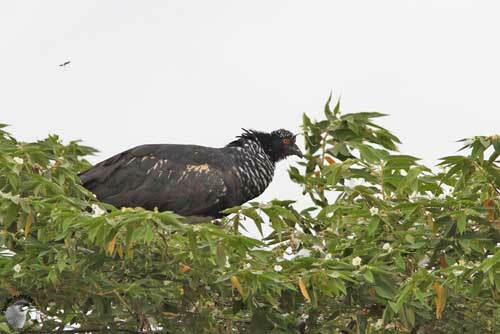 The Horned Screamer is fairly widespread and locally common. Human and hunting pressures involve some declines in most areas. Drainage of wetlands and habitat destruction reduce the breeding range of this species. However, due to its wide range, this species is not currently threatened.